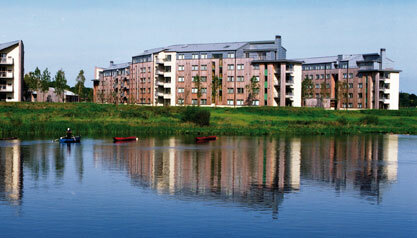 Campus Life Services offers a choice of accommodation for faculty/staff at Univerisity of Limerick. Our one bedroom faculty apartments offer a peaceful living environment yet mintues' walk from the main university buildings. Accommodation is located in either Kilmurry or Thomond Villages where a village manager is on hand to ensure your stay is a pleasant one. Rental fees are paid monthly in advance and include all utility bills, full set of inventory, high speed internet connection via the university network. Living in our faculty housing is hassle free with a professional management team and maintenance service on hand to attend to any queries you may have. Shops are located close to each area and a regular bus service to Limerick operates every 20 minutes from the campus. To check availability please call the Accommodation Service office on +353 61 202331. Alternatively email your query to accommodation@ul.ie and a member of our team will be happy to check availability of suitable accommodation for you. *Rental fees are payable in advance each month. A standing order facility is required as a payment method. Rental fees include all services and a utilities deposit. If the allocated amount of the utilities deposit is exceeded, the excess is deducted from the deposit. Three month minimum stay applies. Short term accommodation is available in Brennan Court Guesthouse for shorter periods.